100% Organic Vegan Superfood Meal! Ease. Meet your best support for your active lifestyle! Allow the finest nutrients in the world to fuel your next hike, run, yoga session, or workout – without the crash! Organic, raw, and vegan – Cacao Plus! is a one-of-a-kind meal or snack that tastes great and makes you feel great. You'll love the subtle hints of cinnamon and ginger. At work, home, school or play...You get sustained energy, mental clarity, and positive mood! All from your food! Truly Unique. Cacao Plus! was created to give you the potent benefits of a truly unique and delicious plant-based meal or snack loaded with supergreens, adaptogens, and raw, organic heirloom cacao. We blend the best cacao from Ecuador, Peru, and Bali to create a synergy of balanced and bio-available nutrients not found in any other protein powder on the market! Absolutely Delicious. Not only does Cacao Plus! taste absolutely delicious with its rich chocolate flavor, but it contains ample amounts of vitamins, minerals, amino acids, anti-oxidants and healthy fats. You get 21 superfoods, plant-based protein and raw cacao to provide your body with amazing health benefits and increased energy levels for an active lifestyle. Cacao Plus! is the perfect mid-afternoon snack, pre- and post-workout fuel or morning pick-me-up. Infused with the top supergreens, adaptogenic roots and herbs, raw cacao and plant-based protein, Cacao Plus! offers a variety of health benefits for EVERYONE that range from mood enhancement to optimal athletic performance. Energy. Boosts your energy in a safe, natural, and effective manner without the “low” that can come from caffeine packed and high-glycemic products. Mood. Enhance your level of well-being with mood boosting botanicals that make your body and mind feel good! Boost your digestive health with micro-nutrients, prebiotics and probiotics, and allow your body to find a happy, lasting balance through healthy levels of chemicals like serotonin. Save Time. Are you busy? Want the absolute best feeling with great taste in 2 minutes? Satisfy your hunger quickly and easily! Immune Boost. Chlorophyll rich superfoods provide your body with much needed micro-nutrients and trace elements that are absolutely vital for healthy immune system response and re-building. Save Money. Give yourself the gift of an amazing shake for under $4.00. And feel like a million bucks! Weight Management. Create your ideal weight! Decrease your cravings for “less healthy” foods like bad carbs and sugars. Balance your appetite. Why will my diet benefit from Cacao Plus? Cacao Plus! is a truly unique blend of the most premium superfoods and cacao on earth. Inspired by the many ancient healing traditions around the world such as Ayurveda, Chinese Medicine and Central and South American shamanic healing traditions, Cacao Plus! represents a “melting pot” of sacred and incredibly healing foods that have been known about and used for millennia. Sarvaa's founder spent 25 years researching and experimenting with these superfoods and their many health benefits to create a synergistic blend that benefits everyone. Not only does Cacao Plus! taste great, it's loaded with the vitamins, minerals, amino acids and fiber content that your body needs to feel its best, build lean muscle, and give you energy! We believe that everyone deserves to have excellent health, and it is Sarvaa's mission to provide you with the best superfood products to help you obtain this level of well-being. ""This is by far the best tasting and most nutrient dense Superfood Meal replacement powder I have ever tasted. I’ve been drinking powdered meal replacements for breakfast (and often with my lunch too) for almost two years. I’ve tried Garden of Life’s ‘Raw Meal’, Vega’s ‘One’, a variety of Amazing Grass’ products, MRM stuff, and a few others whose names escape me at the moment. Comparing them all, Sarvaa Cacao Plus is by far the best. I absolutely love the taste of it. 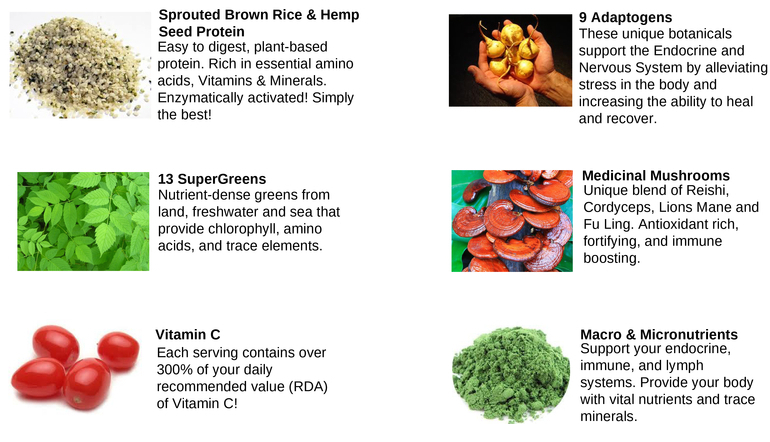 The wide variety of superfoods that comprise the blend are unrivaled when compared to other meal replacement powders. The probiotics and the hint of cinnamon is genius. This stuff blows away everything else on the market! " It's my favorite of Sarvaa proteins! Love that it has everything I need in one yummy powder: protein, greens, adaptogenic herbs, mushrooms, probiotics, nice taste and pure, organic goodness! Thank you, Sarvaa! " Containing 6 g of protein per serving, Cacao Plus! contains a nutrient-dense blend of both sprouted brown rice protein and hemp seed protein. These plant-based blends of protein are not only easy for the body to assimilate and digest, but they contain an ample amount of fiber, no sugar, nearly no carbohydrates, and 80% Pure Protein. Unlike soy protein that contains “oligosaccharides” which are extremely difficult for the body to digest, Sarvaa proteins contain none of the carbohydrates and simple sugars that are detrimental to your health. Hemp is not a starchy grain so is completely Paleo-friendly. And the natural sprouting and fermenting of the Brown Rice Protein truly transforms a lowly grain into a protein powerhouse. You see, normal rice is mostly starch, but after sprouting the protein content jumps up dramatically, then the live enzymes and fermentation process increases the protein even more, so you get the easiest-to-digest, highest quality, organic, earth-friendly, raw, vegan, 80% pure protein! Cacao is possibly one of nature's #1 superfoods. Not enough can be said about this incredible superfood. Native to South and Central America, cacao is considered a "food of the gods" as it was traditionally taken mixed just with water in the form of a tonic to provide increased strength, energy, and nourishment. It wasn't until the 1700's that cacao gained international recognition from early European explorers. Since the discovery of the New World, cacao has been processed into what we now know as chocolate. Unlike traditional refined chocolate, cacao in its raw, unprocessed form does not contain any added sweeteners, emulsifiers, preservatives, or dairy that can be detrimental to health. By itself, cacao is a very healthy food and remains one of the most powerful superfoods on the planet. When it hasn't been roasted or over-processed, cacao is able to retain a high level of nutrients, minerals, fiber, anti-oxidants, essential fatty acids, and even Vitamin C! Anti-aging: High concentrations of anti-oxidants make cacao ideal for fighting free radicals that are attributed to premature aging and some diseases. Heart Health: Ample amounts of magnesium aid in lowering blood pressure, relieving stress, and alkalizing the body. It is said that magnesium is one of the most deficient minerals in the western diet today. Mood Boosting: Cacao is the only food on Earth that contains Anandamide, often known as the "bliss chemical." This neurotransmitter is responsible for feelings of love, and the good feeling you get after exercise or performing a good deed. Stress Relieving: Cacao contains significant quantities of the essential amino acid, Tryptophan, which is responsible for the production of Serotonin, a known neurotransmitter that builds the bodies defense against stress. Serotonin is known for diminishing levels of anxiety, promoting emotional well-being and combating feelings of depression. Weight Loss: Loaded with dietary fiber, cacao is an excellent food for promoting weight loss. Eating cacao stimulates the body to produce digestive enzymes to aid digestion, thus promoting a feeling of fullness that can result in weight loss. There are a lot of questions surrounding the relationship between cacao and caffeine. While its up for discussion, it is believed that cacao is actually a poor source of caffeine. What cacao does contain, however, is a substance known as theobromine–a close chemical relative of caffeine. Theobromine and caffeine are similar in that they both belong to a group of xanthine alkaloids. Unlike caffeine, theobromine does not act as a nervous system stimulant nor is it as addictive. In contrast, theobromine acts to stimulate the heart and is one of the compounds attributed to chocolate's role as an aphrodisiac. Despite claims that cacao contains caffeine, it is still not enough proof to explain our strange magnetism and romanticism towards chocolate. Like most potent plant foods, it is always good to consume cacao with a sense of personal awareness of how much is enough for your body type. Food of the Gods. Raw Cacao is one of Nature's Most Impressive Superfoods. What makes Cacao Plus different? Why should I try it? Organic, Sustainable, Non-GMO, all Plant-Based Ingredients! Only the absolute highest standards are employed from start to finish. It all starts with the health of the soil that the plants are grown in. Then comes the careful tending of the plants to the gentle harvesting and drying, and onwards to storing the botanicals at low temperatures and in non-toxic containers. Finally all of the ingredients get blended together in small batches in a custom, allergen-free facility by a handful of loving people who really care about surrounding your food with the best possible intentions. 1. ADAPTOGENS. What are they? Which do Sarvaa Superfood include? You might ask, "What is an adaptogen exactly?" Adaptogens are a unique set of superfoods that literally “adapt” to the needs of the body. Whether it’s stress, low immunity, recovery or illness, adaptogens work with the body to recreate balance, harmony, and well-being. 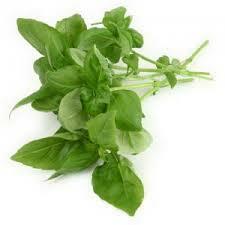 They are best known for their stress-relieving benefits as they greatly benefit the nervous system. Over time, consuming adaptogenic foods will decrease your body’s reactivity to stress. Not only that but you will find that you have more energy, feel happier, and more positive! Cacao Plus! is special in that it includes these radiant botanicals rather than focusing only on protein and cheap fillers. Turmeric Root: Not only is it extremely effective at reducing inflammation,Turmeric assists in digestion, skin tone, and has been studied extensively as a cure for cancer. One of the most characteristic qualities of Turmeric is that it contains curcumin, a curcuminoid that gives the roots its defining yellow color. This active compound makes Turmeric a very effective plant for promoting healthy digestion, boosting immunity, reducing inflammation, and cleansing the blood and liver. This root was so revered by the Polynesians that it was one of few plants carried on their voyage across the Pacific where it eventually landed in Hawaii and is now known as "Olena." It is even thought to have been used as long ago as 10,000 years ago in ancient India. 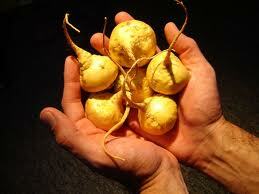 Maca Root. Native to Peru, Maca Root is adaptogenic in that it has the unrivaled ability to re-mineralize the body, increase energy, boost the immune system and support the endocrine system after it has been depleted. It is also well known for enhancing libido and enhancing fertility! Fun fact: Maca Root was used in Peru by native tribes for warriors returning from battle or for women after giving birth! This plant was used as a method for rebuilding the body after intense exertion and depletion. Ashwagandha Root: This powerful, ancient herb has been used in Ayurvedic medicine for centuries. This root has many restorative benefits such as combating stress, improving memory and concentration, reducing anxiety, stabilizing blood sugar, protecting the immune system, enhancing sexual potency, and acting as an anti-inflammatory. This miracle herb translates from Sanskrit to "the smell of the horse," implying that it can offer the strength and vigor of a stallion. Tulsi Leaf (Holy Basil): Native to India, this adaptogen is known as the "queen of herbs" or sometimes the "elixir of life" due to its potent healing qualities. It is considered to be one of the most sacred plants in India and has been used in the holistic tradition of Ayurveda for its health enhancing, life prolonging, and disease preventing properties. Along with strengthening the immune system and relieving stress, Tulsi promotes longevity, heart and respiratory health, aids in digestion and increases mental clarity! Shilajit: Technically a resin, this herbal botanical is considered extremely sacred in parts of India. It literally translates to the "nectar of the Gods" and is considered to be a remover of weakness in the body. It has been used by yogis for millennia to enhance meditation and focus. Shilajit contains a host of trace minerals and vitamins that increase strength, immune function, and stamina. Reishi Mushroom: In Chinese medicine, this mushroom has been used for thousands of years to encourage vigor and long life. This "king of herbs" was used by ancient kings and emperors in a tea to increase wisdom and happiness. Reishi Mushroom has strong anti-oxidant values and is believed to suppress tumor growth in cancer. It is also known to build immunity, respiratory strength, and increase blood flow to the heart. Today in the west, Reishi is often made into elixirs and tonics that aid in vitality and longevity. Camu Camu Berry: This powerful Amazonian superfruit that is native to Brazil and Peru has more Vitamin C than any other fruit on the planet. In as little as a 1/3 teaspoon, Camu Camu provides nearly 200% of your Recommended Daily Value (RDA) of Vitamin C. Rich in amino acids, bioflavonoids, and minerals, this incredible berry has been used to treat viral infections, helps maintain mental clarity, strengthens the immune system, and supports the nervous system. Dandelion Root: This common adaptogen can be used and harvested almost anywhere in the world. Not just a common weed, the root of this incredible plant has been used to treat malfunctions of the liver for ages. Not only can it be used as a liver tonic, but is known to increase energy levels, reduce swelling, aid in digestion, and is known to be a powerful anti-oxidant. 2. SUPERGREENS. Where to get your chlorophyll, vitamins, and minerals. Supergreens are green plant-based foods that contain powerful levels of chlorophyll, a high level of nutrients, vitamins, minerals, and phytonutrients. Supergreens are low in starch and carbohydrates and contain no sugar. Typically, these greens are characterized by a deep, dark leaf due to the high level of phytonutrients. The darker the better! Not only are supergreens cleansing, but they can lower levels of toxicity and inflammation in the body. E3Live AFA Algae: This supergreen is one of nature's most potent superfoods. A.F.A. (Aphanizomen Flos-Aquae) has such a complete nutritional profile that it is sometimes referred to as the #1 superfood. Containing more protein, B12, and chlorophyll than any other food source, A.F.A. has nutrients that are active and directly accessible to the body. Additionally, this amazing superfood has an amino acid profile that is virtually identical to that required by the human body. Chorella: Similar to A.F.A. and Spirulina, this single-celled green algae has a photosynthetic efficiency that allows it to yield more protein per unit area than any other land-based plant. This incredible supergreen provides the body with nine essential amino acids and numerous vitamins, minerals, and oils. Spirulina: Another single-celled algae, Spirulina also contains a rich supply of many vital nutrients that includes protein, complex carbohydrates, iron, and Vitamins A, K, and B complex. Spirulina has countless uses a supplement for maintaining good health for disease prevention due to its rich content of chlorophyll, anti-oxidants, beta carotene, and many fatty and nucleic acids. Parsley Leaf: Don't be fooled by this common superfood! Parsley is considered to be one of nature's most anti-oxidant rich superfoods. Not only that, but it contains more Vitamin C than any other herb! Being a water-soluble anti-oxidant, Vitamin C is responsible for not only reducing inflammation but binds to free radicals to rid the body of dangerous toxins. Parsley also contains incredible amounts of Vitamin K and A.
Tulsi Leaf (Holy Basil): Not enough can be said about this sacred plant of India, sometimes referred to as the "elixir of life." Used in Ayurvedic medicine for millennia, Tulsi has been used for everything from reducing stress and fatigue to prolonging longevity. Its unique set of phytochemicals makes this superfood useful for preventing disease as they possess anti-oxidant, antiviral, adaptogenic, and immune boosting properties. Moringa Leaf: Considered the "miracle tree" in India, Moringa is an exceptional tree renowned for its nutrient density of at least 90 different types of nutrients. It contains more calcium than bananas, more Vitamin A than carrots and at least 50 times more vitamin B3 than peanuts, 36 times more magnesium than eggs and 25 times more iron than spinach! This abundance of nutrients is known to help maintain healthy blood pressure, joint health, endurance, energy and healthy digestion. Nettles: This leafy herbaceous plant can be found in the wild in almost all areas of the world. One of nature's top nutritive and vitamin-mineral rich herbs, the leaves and roots have been harvested for centuries to create tonics for energizing the body and cleansing the blood. Utilized as both a food and medicinal herb, this wild green has a rich history of use in European herbalism as a folk remedy to treat everything from anemia, gout, eczema, and arthritis. Nettles are especially beneficial to the lymphatic system and cleansing the liver. Dandelion Leaf: Another common wild plant is that of Dandelion, which can be found on every continent. Much like nettles, Dandelion has been used as a folk remedy to treat dysfunctions of the liver and blood. Both the roots and leaves can be made into tonics for cleansing and neutralizing your body's pH. Nutritionally, the leaves contains ample amounts of calcium, potassium, zinc, and vitamins A, B, C, and D. Loaded with anti-oxidants and phytochemicals, these greens are great promoters of health for both your cardiovascular and lymphatic systems. 3. PROBIOTICS. What kind of bacteria are good for you? In Cacao Plus! 8 strains of the most potent and "intelligent" beneficial bacteria are included. You may already know Probiotics are very important to your health and well-being. Yet, did you know that you have ten times as many bacteria cells in your body than regular human cells? You have over six trillion human cells and over 60 trillion micro-organisms in you right now! Hard to fully fathom this fact, yet it's true. So you want your "community" of 60 trillion living beings to be very healthy. And it’s incredibly important that this community of bacteria is at least 95% beneficial (pro-biotic) bacteria, and less than 5% bad organisms. Did you know that there is a whole new genre of doctors known as Functional Medicine MDs and Health Scientists who are dramatically extending the breadth and depth of the work that Naturopathic Doctors have been doing for decades? And one of the most powerful areas of research they're doing is in the arena of "gut health" and the specific health and ratios of the various beneficial bacteria. These “pro-biotics” are keeping the bad bacteria in check every minute of your life, so it behooves us to help them out as much as possible! In fact, a collection of these brilliant and dedicated researchers are now saying that your gut health is responsible for over 65% of your total immune system! Did you know that the new term for your personal community of “gut bacteria” is your Micro-biome? Patterned after the excellent results from the Human Genome Project, there is a vastly more complex and rewarding new research arena called the Human Biome Project. This research is helping people who’ve had chronic illnesses who have not responded to any therapies for years! Now hundreds of thousands of people have better resources! After many years of exposure to toxins, processed food, and overly prescribed antibiotics, this "army" of probiotic helpers are coming from Nature to restore your gut health. Not all beneficial bacteria are created equal. Did you know that some of these beneficial organisms are much more intelligent than others? For instance, L. Plantarum is considered a “Leader” and an “Organizer” of the community of micro-organisms in your gut. There are a handful of these "Leaders" in your Micro-biome, and so a large amount of these most essential strains are included in Sarvaa Superfood. There are also beneficial bacteria in your intestines that create more of the essential production of vitamins than others, so again Sarvaa Superfood includes these in abundance. And lastly, there are strains of probiotics that are very robust and do more of "fighting off" of the unfriendly yeasts and bacterial invaders, and these are also heavily represented in the Sarvaa Probiotic Blend. You get the best of the best for free! And all this probiotic goodness is included in your Superfood Meal at no extra charge. You’re getting approximately one dollar worth of probiotics in every serving! This is worth from $8 to $44 depending on which size package you choose! How is this possible? Because the retail mark up on probiotic supplements is the highest in the food business. But Sarvaa Superfood sources the best strains of probiotics in bulk and then pass on the savings on to you with no mark up! 4. SEA VEGETABLES. Supergreens packed with trace minerals, vitamins, and fiber. A unique characteristic of Cacao Plus!, and the other greens-based Sarvaa Superfood powders, is that they contain two of the best sea vegetables: dulse and kelp. These nutrient-dense supergreens are found and grown in the ocean and contain an abundance of nutrients– everything from protein to essential vitamins and minerals. Kelp: An edible seawood that is actually a brown algae, Kelp is best known for its ability to reduce symptoms of arthritis and inflammation in the body. Its rich level of nutrients, vitamins, numerous minerals, trace elements and amino acids make it a superior supergreen for a variety of health boosting functions such as boosting metabolism and strengthening bodily tissues. Dulse: This is a red algae that grows on the northern coats of the Atlantic and Pacific oceans. People have been harvesting Dulse for hundreds of years as both a food source, a skin care and cosmetic ingredient and nutritional supplement. In Iceland, for instance, it has been consumed as an important source of fiber. An outstanding element of Dulse is that it contains all of the trace minerals needed by the human body! 5. MEDICINAL MUSHROOMS. Anti-oxidant packed and Adaptogenic. Perhaps some of the most quintessential ingredients in Cacao Plus! are medicinal mushrooms. These mushrooms have been used for millennia as adaptogens and remedial tonics in healing traditions around the globe. They promote longevity, vitality, and are incredibly immune boosting. Sarvaa Superfood only uses certified organic mushroom varieties that are harvested in the mycelium stage (the youngest) to ensure bioavailability in the body in their raw form. For more information on this topic please visit our FAQs page. Cordyceps: This medicinal mushroom has been used to strengthen the body and mind as both an adaptogen and tonic herb. It is thought to improve stamina, reduce fatigue, enhance sexual function, fight free radicals, balance hormones, and help maintain healthy cholesterol levels. It is even thought to improve athletic performance! Reishi: Used medicinally in areas of China and Japan for thousands of years, Reishi is considered sacred and a "king of herbs." It is believed to encourage vigor, long life, and happiness. Its strong anti-oxidant value is believed to suppress tumor growth and drastically improve immunity. Chaga: Chaga mushrooms are one of the most potent immune system boosters and has been used for centuries as possibly the most potent anti-oxidant on Earth. It has been used as a general tonic and as a powerful ally in general heath and healing. One of the most sought after qualities of Chaga is the abundance of Beta-D-Glucans that it contains. Chaga Mushrooms are a natural Biological Response Modifier (BRM). Research has also shown that Chaga activates immune cells responsible for combating cancer initiation. Lions Mane: Perhaps the most notable use of Lions Mane is its incredible abilities of nerve regeneration and its neuroprotective effects. In the medical community, Lions Mane is being explored as a healthy alternative treatment for diseases of Alzheimer's and senile dementia as it is thought to improve memory while regenerating important nerves in the brain. Fu Ling Poria: Commonly used in Chinese Medicine, Fu Ling has a wide range of medicinal uses that range from lowering blood sugar to strengthening the digestive system. Used in Chinese Medicine to relieve symptoms of "dampness" it is a strong immune booster for those suffering from issues with the spleen, stomach, kidneys, heart and lungs. Simply add 1-4 tablespoons to your favorite milk or water to a blender, shaker bottle or glass jar. Remember to shake vigorously! Since there is already an ideal amount of bioavailable protein, adding milk is preferred for taste although not necessary. Many people find that after a week of daily use, they can go from milk to straight water. And of course, water gives you a lower caloric intake. For an extra yummy treat try adding a splash of vanilla, almond extract or banana. If less calories is what you're going for, try using an unsweetened milk product. If you want additional nutrition, calories, and superfood goodness, we suggest adding chia seeds, fresh ground flax seeds, hemp oil, or coconut oil. For an active lifestyle or a long day at work, you can add an extra tablespoon to help you stay alert, focused, and energetic. Daily! Imagine yourself at 100%. Cacao Plus! and its unique blend of superfoods will ensure that your mind and body really are at 100% every day. Some professional athletes use it twice a day to replace a meal or snack and then eat a more typical meal for dinner. High energy business folks use it all day at work; from the mid-morning slump all the way into the evening. If you are very thin or sensitive (Ayurvedically Vata) then you could try using a smaller amount in the evenings. Since raw cacao has similar effects as some caffeinated teas such as white tea, those with certain constitutions find it to be a bit too stimulating to consume in the evening. Other constitutions typically do not experience these effects. It is also good to be aware that the polysacharides in Goji Berries and the amino acid profile of some of the algae may feel slightly more stimulating than you are used to. Ingredients: *Premium Cacao, *Pea Protein (80% Pure Protein), *Sprouted Brown Rice Protein (80%Pure Protein), *Goji Berries, *Sarvaa Gaia Greens (*Moringa Leaf, *Nettle Leaf, *Dandelion Leaf, *Tulsi Leaf, *Turmeric Root, *Ashwaganda Root, *North Atlantic Dulse, *North Atlantic Kelp, *Opened-wall Chlorella, *E3 Live Klamath Algae, *Cordyceps, *Reishi, *Chaga, *Lion's Mane, *Fu Ling Poria, *Camu Berries, *Parsley Leaf, *Celery Seed, *Shilajit), *Hemp Heart Protein (60% Protein), *Premium Maca Root, *Date Powder, *Lucuma, *Dehydrated Maple Syrup, *Cinnamon, Orsa Salt, *Acerola Cherry, *Vanilla Extract, *Ginger Root, *Sarvaa Probiotic Blend (8 live & active strains), *Monk Fruit, and a tiny dash of Stevia, and LOVE. This is my second time ordering this, I love making a shake/smoothy with it. Its filling, I feel satiated and not weighed down after having a glass. I highly recommend. This product is the best supplement I have ever used. It provides the nutrition I need to help recover after any activity(skiing,biking,running). All of Sarvaa’s products are great. Customer for life. If I could I would give this product ten stars. This product was made with so much care and integrity I feel really blessed to be able to add it to my daily diet. I also have purchased it for my son who has health issues and who travels to India a lot, as a great product he can take with him to help him stay as healthy as possible. The customer service was wonderful, caring and generous. I'm pleased I found this company and foresee continuing to reorder and share this product with family and friends. Love, love, love it! Taste great, mixes easy and I feel great! Derek Van Atta did all the research and homework to come up with all the best mixtures and ingredients that is the very best for us. I’ve been looking for along time, glad I have finally found the right one! I feel good doing good for my body! I think I can say with certainty that this is my Favorite Cacao Superfood Powerhouse! I Love it in a smoothy and I love it Hot.. Either way it is a treat to the senses... Tastes Yummy! Gives me a Boost that does not make me crash in a few hours it is steady and mighty! Did I say it is Delicious? It is!! I have been on Saarva for over a year now and find it to be exemplary among other products I have tried. It's simple to use, digest, and obtain make it the number 1 reason I continue with this until something better comes along--you just can't beat it! Excellent ingredients organic and highest quality from the parts of the Earth that provide optimal nutrition. My workout performance has never been better. It is also good for maintaining weight and my ultimate daily nutrients. Can't imagine being on any other! A friend shared this with me and I'm so glad she did. I promptly ordered a whole bunch. I don't drink coffee but this has become my equivalent daily morning beverage. Delicious, mood-enhancing, awakening and enlivening without any sort of crash, and makes my body feel clean, light, healthy, and strong. And did I mention delicious? I can't say enough good things!